Happy 2 Months of this online dating adventure to me! 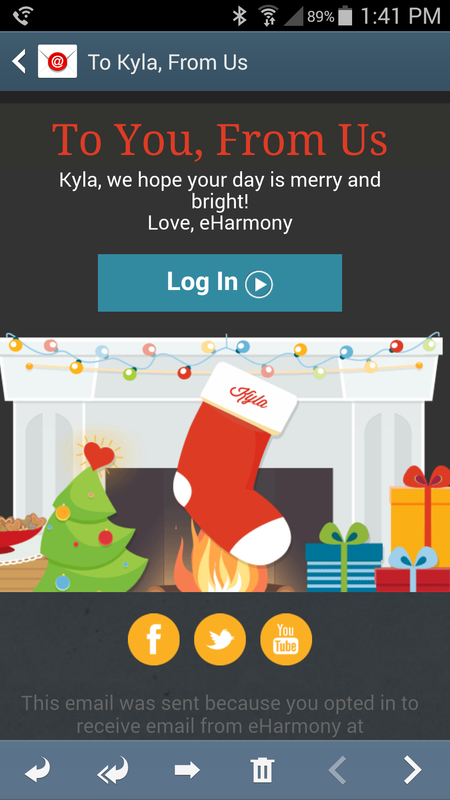 First off, I got this on Christmas Day from eHarmony.com. One lonely stocking hanging on the fireplace. Well played, eHarmony. Well played. Also, checking off something else from my “30 Before 30” checklist, I went on a date with a man I met on the internet that actually counteracted this date. THANK GOD. Literally and genuinely. He’s a nice man – a bit odd, but then again, I’m a bit odd too. We wandered around Downtown Disney, drank too much coffee, and sat on a bench overlooking a lake after the sun went down, chatting, laughing, and holding hands. I learned quite a few important things this past Friday that I thought I’d share. Ready? If you tell your family and/or friends that you’re going out with a man you met on the internet, be prepared for several phone calls and text messages. Especially if your date is planned for 3:00 pm and you don’t get back to your mom’s house where you’re spending the night until 1:45 am. Texting “I’m not dead” is only appropriate if you’ve cracked jokes with the recipient about how you’ll check in to prove you’re not dead. Otherwise, you may freak your sister out. Sorry, Kelly. Don’t go to Downtown Disney the day after Christmas unless you’re ok with either a) looking for a parking spot for over an hour or b) parking over 3 miles away and taking a bus to get there. There is at least one man who finds me physically attractive. (Somewhere at least 2 of my friends are reading this and screaming “I HAVE TOLD YOU THIS FOR YEARS! !” at their smartphones. Yes. You were right.) Considering the bullying that happened to me growing up, understanding/believing this is a new development for me. And it feels strange and amazing. Having a good date with a man who lives far away from you and leads a busy life is almost worse than not dating at all. You know the possibility for spending more time getting to know someone you’re interested in exists, it’s just not anytime soon. So, yeah. I have no idea what might happen in the future. For right now, it is more than enough to say that I like what I know about him so far and look forward to going on another date with him. Even if the earliest it can be is mid-January.